Selling advertising space on a website or blog is the sign of huge success for the bloggers and webmasters. Most of the bloggers consider that getting approval and running Google Ads or ads of other premium advertising networks is the success. But selling an ad space of the website to a direct advertiser is what considered as the real success. Usually, advertisers do not wish to advertise their products and services directly on a website for some reason(s). They will advertise only on high-quality websites with good content and brand. If you attract the direct advertisers and sell your first ad space that is the day of real success in your career. In this article, I will discuss my experience in selling ad space(s) of my website to direct advertisers and tell how to sell ad space on your website. Selling an ad space/ad inventory directly to an advertiser is direct advertising. In the case of direct advertising, no middle agent will involve in the process. Usually, bloggers prefer ad networks to monetize their website. The ad networks will automatically fill the ad spaces of the publisher website with relevant ads. For every valid interaction, the publisher will be paid by the advertiser. And for managing the activities and connecting the advertisers to the publishers, the ad networks will take a share from the publisher revenue. For example, Google Adsense share 68% of revenue to the publishers and take 32% from overall revenue. So, the publishers lose a part of the revenue generated by them if they go with ad networks. In the case of direct advertising, the whole will come to your pocket and you have full control over the ads displayed on your website. Increase the site revenue – Join CPS affiliate networks. Not everyone can sell their ad spaces to a direct advertiser. The potential advertisers will look into several factors before they advertise on a website. If you have a website which is very familiar in a specific category or a super brand website which target multi-category, you have chances to attract direct advertisers. Websites with low traffic are not fit for direct advertising. But they can try the ad selling sites to attract direct advertisers. These are some of the basic requirements if you’re looking how to sell advertising on your website. For selling ad space on your website, the first requirement is traffic. Your site must generate high traffic in order to attract potential advertisers. The website must receive major traffic from the search engines. While Alexa ranking is not considered important, the advertisers first verify the Alexa ranking to get an overview of the website. Good Alexa ranking can be achieved only by getting high traffic, low bounce rate and high time on site. You must have a site with high-quality design and ad inventories with high viewability. Poor layout design and color setting will give a bad impression on your website. The age of the website is one of the important factors that will be considered by the direct advertisers. The website should be old enough to build trust among the internet users. Webmasters should concentrate on branding if they wish to sell advertising space on website. The website must have high-quality unique content for selling ad space. Unlike ad networks, the advertisers will advertise only on sites with high quality, unique content. Direct advertisers don’t prefer general category sites which have mixed content. Instead, they prefer category specific sites. 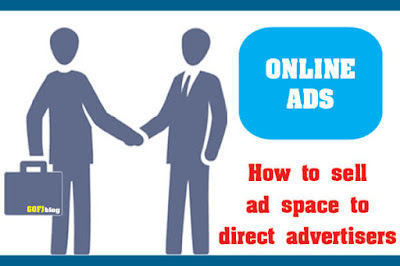 The first rule to start selling ad space on a website is, letting the advertisers know that ad space(s) are available for direct advertising. This can be done by adding an Advertise page on your website. You can check out my site’s advertise page here – Advertise. Put a link to the Advertise page at the top of bottom of your site. The Advertise page should contain all the information about your website. Give an overview about your website, traffic stats, rank etc. Tell the reason why the advertiser should buy the ad space(s) of your website. If possible add a downloadable media kit to make it more professional. To let the advertisers know how the ad will appear on your site after purchase, add the screenshot of your web page highlighting the ad space(s). This will help the advertisers to visualize how their ad will appear on your site. Do not add too many ad spaces because it might reduce the site value. Limit the ad spaces to two and maximum three. Advertisers prefer ad inventories above the fold for maximum viewability. So, sell the ad space(s) above the fold. The ad sizes must be most commonly used sizes like 300 x 250, 728 x 90, 125 x 125. The most challenging part in selling advertising space is fixing the price for the ad space. By fixing high you make the advertisers run and by fixing low you give some free ad impressions. If you want to sell ads to direct advertisers and make more profit compared to the ad units of the ad networks, you must analyze the performance of the ad space(s). 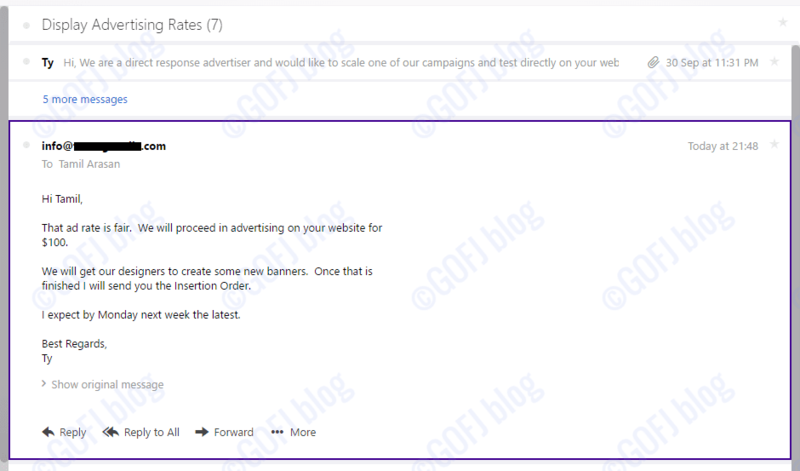 You can use the banner ad unit of the ad networks or affiliate ad banner to test the primary factors like CTR, CR etc. After analyzing the clicks, sales, and leads fix a profitable rate for the ad space. Do not copy the ad rates from other sites which can outperform or underperform. You can mention the ad price on the advertise page or you can tell them to the advertisers when they enquire. When the direct advertisers inquire about the ad space(s), you must handle them carefully. Apart from the details given on the Advertise page and the media kit, the advertisers might question you more about the advertising policies. If you did not mention the ad rate on the Advertise page. Send the price for the ad space. Ask the Advertiser to send the ad creatives and the landing page URL. Only accept high-quality category relevant ads. Here are some of the inquiries I’ve received regarding the direct ad sale. Few words are hidden to protect privacy. I’ve sold the ad space(s) of my website many times to different advertisers. This one is the first in my history. We had some deep discussion about the advertising. I made sure that the creatives used for advertising are of high quality. 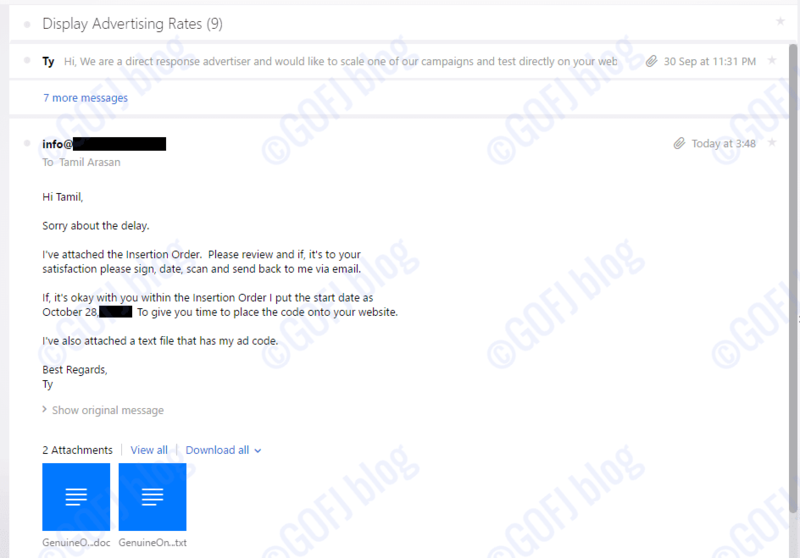 I’ve sent the rates for the leaderboard ad format and the rectangle sidebar ad format. He then confirmed that he wants to advertise on sidebar 300 x 250 above the fold. Based on the ad space performance and the impressions, I’ve fixed the price of $150 to advertise on the sidebar. The advertiser said $150 is a good price for the ad space but he asked me to reduce the price further. Since that was my first direct ad sale, I thought not to miss the opportunity. I accepted to sell the ad space for $100. Both of us are happy with the deal. As a part of direct advertising, both advertiser and the publisher should sign the contract to prevent fraudulent acts. We both signed the IO before starting the direct advertising campaign. I’ve scanned a part of the IO (for your reference) which contains the terms of the advertising campaign. After agreeing to the terms, I’ve placed the ad code on my site. After a review with full satisfaction, he paid me through PayPal. This is the first time I’ve sold the ad space to a direct advertiser. I’ve learned more about selling direct ads after the first sale. Then after I’ve sold the ad space many times. If you’re struggling to sell ad spaces on your sites directly, you can go with third party direct advertising networks to sell ad space. The third party ad networks will help you to display your site in front of the potential advertisers. The advertisers will easily find your site to advertise. For helping you for selling ad space on your website, the direct ad selling network will take a share as commission which will vary based on their terms. I’ve sold ads through these networks many times. The advantage is you can sell impressions to multiple advertisers or you can sell on fixed monthly basis to a specific advertiser. The best sites to sell ad space are Buysellads and Adclerks. Read my review about Adclerks. These sites only accept high-quality sites with good traffic. Selling ad space directly to an advertiser can be profitable compared to using ad networks. By selling ads, the brand value of your website increases. Your website will get special attention among the bloggers. Your love towards blogging increase if you sell the ad space to a direct advertiser. Increase the revenue of your website by installing ads of CPC ad networks/CPM ad networks and by selling ad space at same time. Selling ad space on your website is very hard unless there are quality content, high traffic, and consistent branding. Finding potential direct advertisers is a hell. You might end up in failure even if you have a high-quality website. Maintaining the sold ads is a headache. Direct advertisers might opt-out of the advertising campaign if they don’t get results. Satisfying the direct advertisers is a tough job. Direct advertisers prefer US, AU, CA, UK and European traffic. They consider traffic from other countries as low-quality traffic. There are high chances of getting cheated on either side. If you’re struggling to sell an ad space on your website and ask how to sell ads on my website. The reason might be that the potential advertisers had no opportunity to find your website. In such cases, you must let the advertisers know about your website. The first option is you can sign up in direct ad selling site which is explained above. There your website will be featured in front of tons of potential advertisers. You have the chances to sell the ad space within the first month. If you don’t wish to pay commissions to the direct ad serving sites, you can join the site and verify the accounts of other publishers to find the advertisers. Use Google Adwords and ads of other ad networks to find the advertisers in your website category. Hope now you’ve got an idea about how to sell advertising space. I wish you to succeed by selling the first ad space of your website.